An all-in-one electronic control that can combines defrost, temperature control, monitoring and alarming and leak detection into one system. 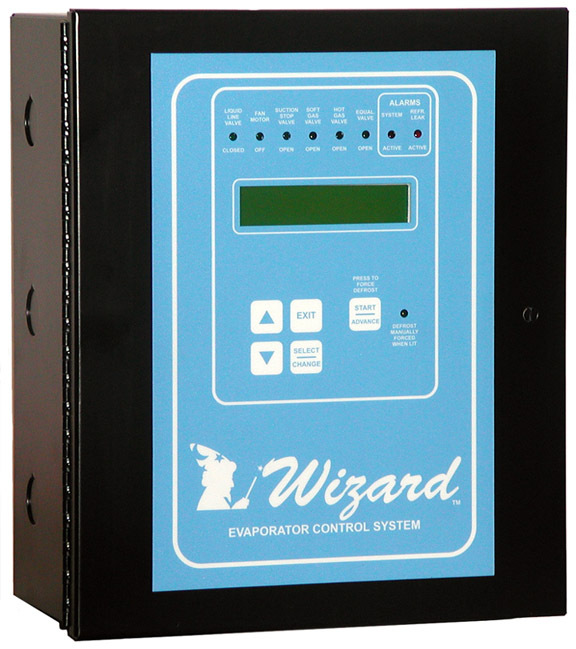 The Wizard Single Zone (WEC) and (WEC-L) Evaporator Control Systems with Refrigerant Leak Detection allow you to control and monitor the temperature and defrost using a single room temperature sensor and have Refrigerant Leak Detection adding one Sherlock Leak Sensor. The WEC has a series of status LEDs on the front panel that allows the user to easily determine the status of the Evaporator Valves and contactors. The WEC is an electronic control and time clock. The time clock can operate up to 12 defrost cycles per day with three separate defrost schedules as well as a manual defrost. The defrost can be either gas, electric, water or off-time defrost. The WEC will cycle all valves necessary to perform a defrost of some of the more complex refrigeration systems. Daily Schedules. The control has three unique defrost schedules: Weekday (Monday - Friday), Saturday and Sunday. Automatically adjusts time for daylight savings. The WEC can be set to automatically change the clock for day light savings or can be set not to change if the facility is in states where daylight savings is not observed. The Daylight Savings Schedule is set through 2020. Can schedule up to 12 defrost cycles per day. The WEC can be programmed to run up to 12 defrost cycles per day. The control will automatically space out each cycle evenly or allow the user to program the start times. Gas, Electric, Water, or Air defrosts. The WEC can operate defrost circuits that are either Off-time, Hot Gas, or Electric. Steps that are not used can be set to 0 minutes, and the controller will skip over them to the next step. Demand Defrost - Liquid Line Solenoid Feed Time. The WEC can initiate its defrost cycles base upon the total liquid feed time. This option can be used to activate the system only when the "Number of Cycles per Day" set to zero. The liquid demand delay can range from 0 to 24 hours, in fifteen minute increments. Demand Defrost - Remote Activation The WEC has a digital input that forces the control into the defrost cycle. This input can be used to activate the system for an additional defrost cycle, or with the "Number of Cycles per Day" set to zero, the input can be wired to a gang defrost clock and a number of WECs can be staged evenly or to a frost sensor and the WEC will defrost only when necessary. Clicks-On Thermodisk (Dry Contact). By providing a closure across the Defrost Termination input terminal, the WEC will terminate the Defrost Cycle. The Clicks-On should be mounted on the coil and should have a temperature rating corresponding to cleared coil temperature. Suction Pressure Switch (Dry Contact). By providing a closure across the Defrost Termination input terminal, the WEC will terminate the Defrost Cycle. The pressure switch should be mounted on the suction line and should be set to a suction pressure corresponding to a cleared coil. Termination Temperature Sensor. The WEC will monitor a temperature sensor mounted in the coil. The WEC will terminate the Defrost Cycle when the temperature exceeds a selectable Termination Setpoint. Time. If the WEC does not detect a termination signal, the Main Defrost Cycle will terminate at the end of the programmed cycle duration. Each WEC comes with a temperature sensor for monitoring or controlling the temperature in the refrigerated room. The control monitors for both high and low alarms each having its own programmed delay when programmed. The WEC will maintain the space temperature by cycling the LLS based upon a Temperature Setpoint and a plus/minus differential. The WEC will open the LLS when the temperature reaches T = Setpoint minus Differential Value. The WEC will close the LLS when the temperature reaches T = Setpoint plus Differential Value. Temperature Control Setback -- The WEC allows the user to set a setback schedule, where the control will operate the temperature control functions at a higher setpoint during a specified time period. The setback schedule has a Monday - Friday, a Saturday, and a Sunday schedule. Fan Cycling -- The WEC can cycle the evaporator fans once the temperature within the space is met. The WEC will also restart the fans after a setable delay to prevent stratification of the air. The WEC can monitor three independent temperature sensors, the Temperature Control Sensor, the Defrost Termination Sensor, and an Auxiliary Temperature Sensor. Temperature Control Sensor -- This sensor consists of the the sensor used by the WEC for temperature control. All alarming is disabled during defrost. Once the WEC controller returns to normal refrigeration, the alarm delays will begin as if the sensor has just exceeded the alarm conditions. Auxiliary Temperature Sensor -- This sensor is an additional temperature sensor that is monitored and logged, it does not control any WEC processes other than alarming. The user can choose whether the alarms are disabled during defrost or if the alarms are active during defrost. Defrost Termination Sensor -- This sensor consists of the sensor used by the WEC to terminate the defrost cycle based upon the coil temperature. Should this temperature read above the setpoint level of the termination setpoint for over 30 minutes, the WEC will activate its systems alarms. High Alarm . The space temperature must exceed the High Alarm Limit for a time period longer than the Hi Alarm delay. This function shall activate the control's "System Alarm Relay 2". Low Alarm . The space temperature must be below the Low Alarm Limit for a time period longer than the Low Alarm delay. This function shall activate the control's "System Alarm Relay 1". Termination Temperature High Alarm. The WEC will activate alarms if the termination Click-On or the Termination Temperature does not recover within 30 minutes. This function shall activate the control's "System Alarm Relay 2". With the addition of a Sherlock Refrigerant Sensor, the WEC makes any refrigerated room ASHRAE 15, IIAR 2, and Uniform Mechanical Code Compliant. The WEC will activate alarms based upon two alarm levels. At the first alarm level, the WEC will activate the Gas Leak Level One Alarm Relay, activating any alarm notification system connected to the WEC. At the second alarm level, the WEC will activate the Gas Leak Level Two Alarm relay, activating additional alarm indication equipment and any additional safety procedures as required by local codes. The WEC gives the user an option to pump down, then isolate the evaporator coil should the leak concentration exceed level two. Gas Leak Sensors - The Sherlock Refrigerant Gas Sensor is connected to the control module via a discrete, three conductor cable. The sensor can be mounted up to 800 feet away in locations where leaked refrigerant is likely to concentrate. Alarm Level Settings - The WEC allows two unique Alarm Setpoints for the refrigerant gas sensor throughout its operating range. When an Alarm Setpoint is exceeded, a corresponding alarm relay is activated Each Alarm Setpoint has a programmable Alarm Delay, 1 to 120 minutes. The sensor reading is required to exceed an Alarm Setpoint for the programmed amount of time before the control activates the corresponding alarm relay contacts. For example, if the Alarm Setpoint is 200 and the Alarm Delay is five minutes, the control will enter an alarm condition only if the sensor detects a level of 200 or higher for more than five minutes. The WEC has a programmable option that will pump down and isolate the coil when the Sherlock sensor reading exceeds the Alarm Level 2 Alarm Setpoint. With the high costs of electricity and the requirements for reducing energy usage during periods of high demand, many companies are looking for assistance with their load curtailment programs. Some utilities are setting up Demand Response and Load Curtailment programs to compensate energy consumers for temporarily reducing their demand for power. Consumers reduce loads by shutting off equipment or adjusting their operations to reduce energy usage. The WEC Evaporator Control System can allow the user to change the Temperature Control Setpoint to a higher value in order to reduce energy demand. 1) Dry Contact Closure - The WEC has a dry contact input for Load Shedding Operation. This input can be connected to a Load Monitor, a Current Switch to activate the Load Shedding routine when the facility approaches a high demand levels, or a manual switch. 2) Manually Forced - The WEC will operate in the Load Shedding mode if forced in the control software. 3) Daily Schedule - If activated, the WEC will go into Load Shedding at the same time daily. 4) Gencom Communications Interface - The WEC Control Panels can be placed into Load Shedding via Gencom Communications System. Some refrigerated facilities need to be placed into Shutdown or Standby at certain times, whether they are a seasonal facility (i.e. only stores produce during the harvest season), require maintenance or cleaning, or a production room where the room is not used during the overnight hours. 1) Dry Contact Closure - The WEC has a dry contact input for Standby (Shutdown) Operation. 2) Manually Forced - The WEC will shutdown operations forced in the control software. 3) Daily Schedule - If activated, the WEC will go into Standby at the same time daily. 4) Gencom Communications Interface - The WEC Control Panels can be placed into Standby via Gencom Communications System. 1) Fans Run During Standby - The option of whether to shut off the fans when the evaporator is shutdown. 2) Refrigerant Leak Monitoring during Standby - During cleaning of a process room, the temperature and humidity of the room can increase dramatically. These increases may cause false alarms with the leak alarms. This parameter gives the operator an option of continuing to monitor for refrigerant leaks during shutdown. Note: This parameter is visible only when the WEC is configured for Leak Monitoring. With an optional Remote Temperature and Humidity Sensor, the WEC can Monitor and Control alarm, and log the humidity of the room. GenCom Communications allows the computer operator to access the controllers within a facility via a PC. All control programming and logging functions are accessible and can be set or changed from the computer. The user can view all text and data logs, make programming changes to the controller, initiate defrost cycles, and investigate alarm conditions.